Tierney Augustine (red) scored the only goal of the game for City of Peterborough Ladies at Dereham. City of Peterborough Ladies can start chilling the champagne after their hard fought 1-0 at Dereham in East Division One North. 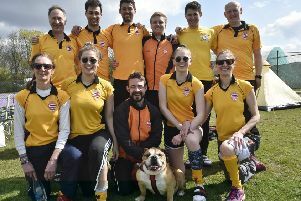 The win at the home of oen of their closest challengers for promotion means City require just two points from their final three games to ensure they are playing Premier Division hockey next season. Teenager Tierney Augustine scored the only goal of the game early in the second-half. It had been tense until that point with teams spurning chances to score. But the goal knocked the stuffing out of Dereham who didn’t threaten an equaliser until the last minute when they fluffed a short corner opportunity. Emma Faux was named City’s player-of-the-match for some fine defensive work. City should clinch promotion next Saturday (March 11) when lowly Norwich Dragons seconds are the visitors to Bretton Gate. Tomorrow (March 5) City have another huge game when travelling to Cheshire to play Alderley Edge in the quarter-final of the English Hockey Ladies Trophy.